Kaity and Kyle are such a sweet and genuine couple and are getting married this fall! These two actually met on Tinder and had their first date at Starbucks for coffee. Kaity tells me that they connected over learning that they were both history majors attending Tennessee Tech University! It’s funny how the universe works sometimes in bringing people together who were so close and share the same passions all along! 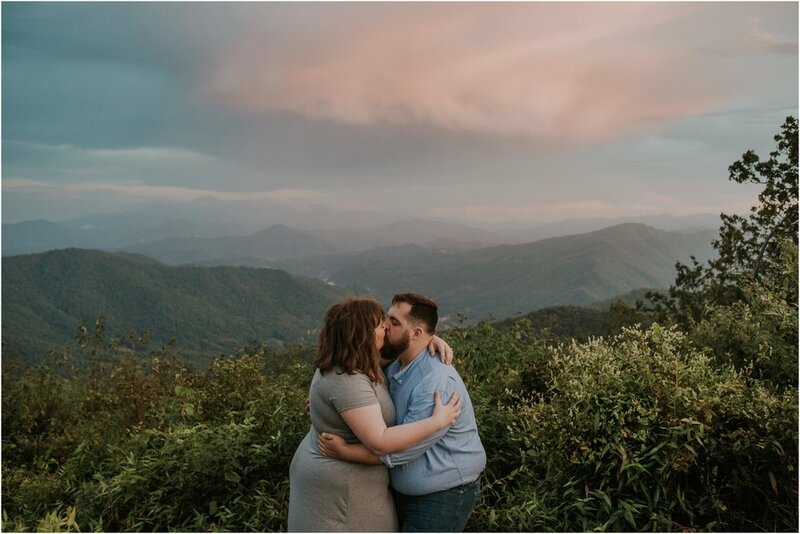 For their engagement session, Kaity and Kyle drove from Middle Tennessee to meet up with me at one of my favorite mountain locations- The Beauty Spot. Located in the heart of the Unaka Mountains, the Beauty Spot always lives up to it’s name and this night was no exception! When we first arrived, the sun was out, but dark clouds loomed over the mountains headed our way. We shot for a while, always keeping an eye on the clouds. Eventually, the clouds passed right over the Beauty Spot, but thankfully not even a drop of rain fell! We finished the evening laughing, getting to know each other, sharing stories and enjoying a bright pink sunset on the bald. Kaity and Kyle - - you two are so incredibly sweet and I am so excited for you two to become husband and wife! I cannot wait for your wedding in just a few weeks- it’s just around the corner! See you soon!